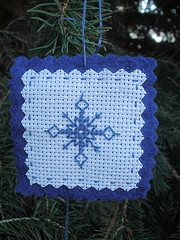 This is another Christmas ornament I made that is available in my shop, Harvest Moon by Hand. The design is stitched on white 22-count Aida cloth. It is hand-stitched onto two layers of blue felt. The design itself on the aida cloth is 1 1/2″ x 1 1/2″. It is hand-stitched onto two pieces of dark blue felt that is 2″ x 2″. There are four different designs that I made using either light blue or dark blue floss. All are sewn onto dark blue felt.